On the 24th November 2017, Templemore College of Further Education was awarded the Erasmus+ Charter. The Erasmus+ VET Mobility Charter is for Vocational Education and Training organisations that have a track record of organising high quality mobility projects for their staff and learners. Currently, Templemore College sends 35-40 students abroad each year to complete work experience placements. Teachers from the college also get to participate in the Erasmus+ programme, by accompanying students or by completing work experience placements themselves. The placements are funded by the Erasmus+ programme, in association with Léargas. Students can complete their work experience in Spain, France or Germany, in a wide range of areas; IT and Networks, Tourism with Languages, Business, Media Studies, Hairdressing, Beauty Therapy, Complementary Therapies, Make-up Artistry, Sports and Recreation, and Horticulture. With the award of the Erasmus+ Charter, the college is guaranteed funding until 2020/21 to implement its international programme. The college aims to expand its current Erasmus programme over the next few years. 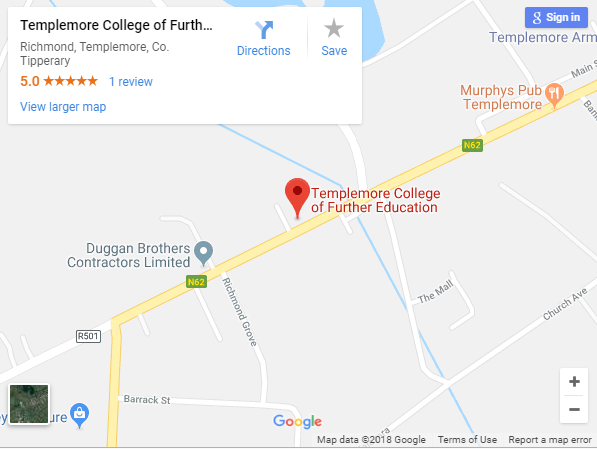 We aim to double the numbers of outgoing students and to begin to welcome students from all over Europe to Templemore to come here to study and complete work experience placements in local enterprises. photo. “Léargas director, Jim Mullin, presenting the ErasmusPlus VET Mobility Charter to Siobhán Keating, Erasmus+ Coordinator, Templemore College of Further Education.